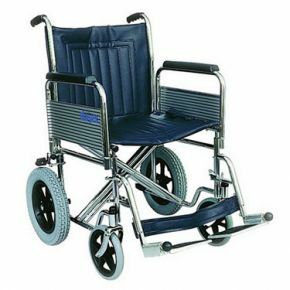 Heavy Duty Transit Wheelchair Strong And Durable. This heavy duty transit wheelchair is made from heavier gauge steel tubing than most standard wheelchairs, for excellent strength and durability. It is reinforced with a double cross bar and the upholstery is double thickness to give extra support and durability. The armrests are detachable for site transfer, and the footrests can either be swung away or detached altogether. There is a calf strap, solid front castors, and a choice of two generous seat widths. This is an excellent transit wheelchair for heavier users, and suits those up to 140kg or 22 stone in weight, although it can of course be used for anyone lighter as well. Seat width available............20" or 22".